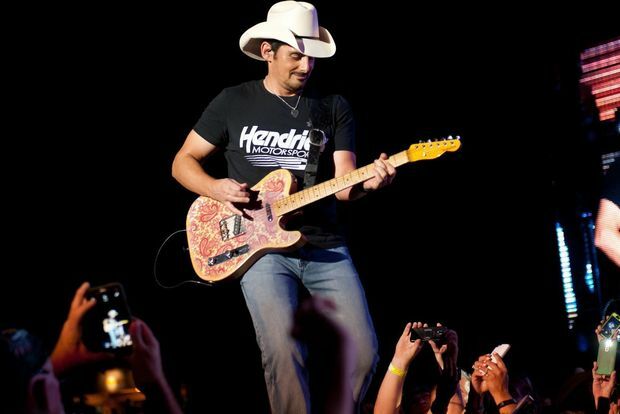 If singers want to know how to keep the stage show fresh and fun year after year, they could and should take a good look at country music's Brad Paisley. Because year after year, Paisley puts on a tour that mixes music with video, animation and solid support that leaves fans feeling they got more than their money's worth. It was no different Sunday night with Paisley's "Crushin' It" tour stop at Hollywood Casino Amphitheatre. He opened with "Riverbank" and by the fourth song, was showing off his knack for staying current with "Celebrity." Fans know the song pokes fun at famous people and their foibles, with the video featuring a giant foam-headed Paisley. This year's version included jabs at Deflatefate and Tom Brady; Miley Cyrus and the naked wrecking ball and of course, the Kim Kardashian champagne glass and rear-end shot. Just spotting all the celeb-poking in the video is fun enough; never mind that Paisley sings and plays guitar like his life depends on it. During "This is Country Music," part of his clever onstage video set included small videos of the artist he pays tribute to playing to the right of the stage, including Conway Twitty and "Hello Darlin'" and George Strait and "Amarillo by Morning." Paisley recognizes the icons of music. He brought up football,asking the crowd if they loved the Rams (to a decidedly cool reception) and then earned a roar when he switched to the Cardinals. Yup, Brad, it's a baseball town. He brought out opening act Justin Moore to duet with him on "I'm Still a Guy" and posed for a selfie - a fact trumpeted by the giant "Manly Selfie Moment" graphic that flashed on the video screen as they did. And while Paisley played nearly all of his big hits -- 22 of them before the night was over! - never did it feel rushed or rote; his voice was in fine form and so was his guitar playing. 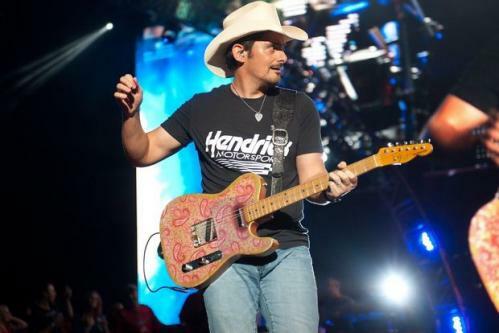 While a good many country singers use a guitar more as a prop, it's an essential part of Paisley. When he started the ballad "Whiskey Lullaby" he famously sang with Allison Kraus, featured act Mickey Guyton sang Kraus' part. And anyone who paid little attention to her set that started the night learned quickly that Guyton held her own and then some with a big and beautiful voice. Then he turned high-tech again, pretending to call Carrie Underwood on facetime and using a clever recorded bit with her to duet on "Remind Me." It would be easy to think it was an actual live call, and Underwood's bit at the end stressed their bantering relationship made famous by their turns as co-hosts of the CMA awards. Paisley finished his main set strong with "Crushin' It," which marked his animated song for the night with Strait, Luke Bryan, Jason Aldean, Darius Rucker and others all making superhero appearances. His three-set encore of "Online," "Then" and the obligatory "Alcohol" closed out another show he crushed. Play on tour name intended. He got brilliant opening support from Moore and Guyton. Moore's eight-song set included "Small Town Throwdown," "Til My Last Day" and "Bait a Hook," among others. And the swagger he showed on stage a few years back has evolved into a welcome and very funny self-deprecating humor, as he told fans on the lawn that "I don't look any bigger up here than back there" - a reference to all 5-foot-6 (and a-half) of him. But he's got a mighty voice, and wrapped up with "Small Town USA" - even bringing out surprise guest Kip Moore, who played the amphitheatre earlier this summer. Guyton showed far more poise and polish than many new acts can muster, covering seven songs including a nice cover of Patty Loveless' "Blame It On Your Heart." Guyton's best known song, "Better Than You Left Me" she sang after explaining it was about an ex-boyfriend "who's an a-hole." And hasn't nearly everyone had a relationship like that?